Staff at a Sainsbury’s store in Hastings have been praised for paying an 82-year-old woman’s shopping bill and getting her a taxi home after she had her purse stolen. Christina Knight had got to the tills at Sainsbury’s Local, in Station Approach, on December 20 when she noticed her purse – which contained £300 – was missing. She called her niece Victoria Simpson who assumed her auntie had simply misplaced it. However, during the panic, members of staff offered to pay for her shopping and arranged for a taxi back to her house in Hastings, where she lives alone since the death of her husband last summer. In the days that followed, Christina was visited by members of staff who had raised £170 to help cover some of the money she had lost. Victoria said: “I got a call from auntie saying she had her purse stolen and I thought she’s probably just forgotten it. “She told me the places where she had been before Sainsbury’s and when she said someone had taken it, it was hard to believe. “Then she told me Sainsbury’s had paid for her shopping and given her some money to get home. I was so shocked as it was clear someone had stolen it but the staff were so amazing about it. Victoria said four members of staff attended Christina’s house days after the theft with £170 they had raised for her. She said the staff members who helped her auntie were Paddy Cody, Sandra Yates, Kate Clark, Sam Skinner and Mick Gillingham. She added: “I am just so thankful. “Without them, I don’t know how she would have got home. I am so grateful for what they have done for her. “Since the incident, she has gone in there often as she feels safe as the staff really looked out for her, rather than being scared to go back to a place where her purse was stolen. Charlie Dyer, store manager at Sainsbury’s Hastings Local, said he was ‘really proud of the kindness’ demonstrated by his colleagues. 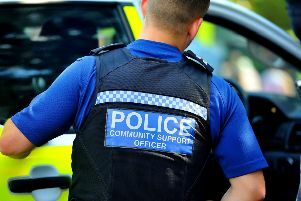 Sussex Police said they received a report on December 20 of a theft of a purse from an 82-year-old woman. Any witnesses report online quoting serial 481 of 20/12.